The figures they rave about say that belief in God declined from 92% to 89%, That's 3% which is in the margin of error. In an election they would call it a dead heat. But "religion hasn't changed" is not comforting to atheists, nor does it sell copy. My thesis is that there is a real problem and Christians should not feel complacent. Yet belief in God is not declining. http://tobingrant.religionnews.com/2014/01/27/great-decline-religion-united-states-one-graph/ They explain the gradual decline they chart over five decades but they never explain what they take as "average." With no analysis of the context for establishing the "average" the whole thing is meaningless. RNS is a non-profit, limited liability corporation owned by the Religion Newswriters Foundation and based at the National Press Building in Washington, D.C., with a business office at the University of Missouri School of Journalism in Columbia, Mo. RNS’s mission is to provide in-depth, non-sectarian coverage of religion, spirituality and ideas. Apparently they also deal in yellow journliam. What does the pew study really say? "The share of U.S. adults who say they believe in God, while still remarkably high by comparison with other advanced industrial countries, has declined modestly, from approximately 92% to 89%, since Pew Research Center conducted its first Landscape Study in 2007.1"
As I said before this is in the margin of error. They alway7s assume any survey could be off by 3% so they call it a dead heat in an election. What is really funny is that they will answer my book by saying M scale is a survey so it's not scientific, when it's a survey that suggests a loss in God belief atheists are all to happy to accept the validity of surveys. But atheism is not increasing in fact it could be an increase in belief since it's in the margin of error. Belief in God is down among the nones. It's down from 71% to 61% but that's 61% of 10% of the country so it's in the 3% over all. Nones up from 16-23% That is not a loss in belief in God it's a loss in Christianity or maybe not even that but in organized church goers. Over all 77% still identify with a faith. Gallop offers figures from a a 75 year period given that long view we can see a real change in the level of non affiliated in the last 20 years but while that is undeniable there have been ups and downs before. 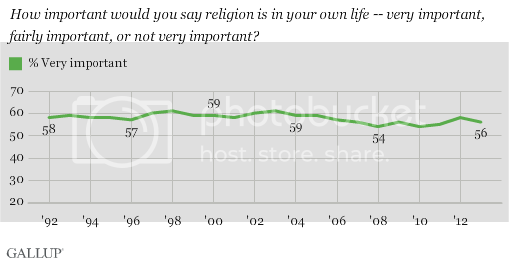 http://www.gallup.com/poll/1690/Religion.aspx It's only been within the last 20 years that none and non-denominational grew enough to report. While none has increased a from 2% to 16% (1948-2016) so has non-denominational grew proportionately. The loss in protestants could be taken up in growth for non-denom and none.Between 1948 and 2015 Protestant declined from 69 to 37%. Call it 40%. That 20% could be the 10% rise in nonn-denominational and 10% none that would fit with the stats. The majority of nones still believe in God. That would only be a 5% decrease in Christianity. That means there could be no increase in atheism. Most of that fits with the charismatic movement that spawned ecumenical feelings. We see from the graphic at the top that religiosity has held stable much more so than the religious news article would have us believe. While America slips in Christian id China gains. Realistically we should assume there's been more loss in Christian belief, maybe 20%. That is a problem Christians should be concerned. At the same time there is an increase in Christians in places like China. At the same time, according to "A Star in the East: The Rise of Christianity in China," Christianity is surging in China. The authors of the new book – Rodney Stark, co-director of Baylor University's Institute for Studies of Religion, and sociologist Xiuhua Wang – explained that in 2007 there were about 60 million Christians in Communist China. Now, they noted, more than 40 new Christian churches (not including underground churches) are starting up every week. "If this trend were to hold for even another decade," they wrote, "there would be more Christians in China than any other nation in the world."